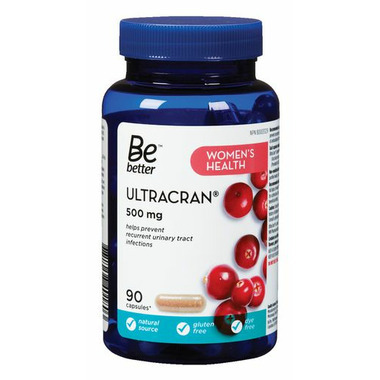 The Be Better UltraCran Whole Cranberry Berry Concentrate is a natural, gluten free, and dye free women's health supplement that helps prevent recurrent urinary tract infections. Gelatin capsule (gelatin, purified water), rice starch, silica, magnesium stearate. Consult a physician prior to use if you have a history of kidney stones or are taking blood thinners. Consult a physician if symptoms persist or worsen.